COPYCAT BRACELET CLASS – Saturday, March 9, 9:30 A.M.
Well, Val is at it again…this time she will be teaching the beautiful Copycat Bracelet class! She assures me that this is a very easy technique! Made from 3mm and 4mm Bicones, and seed beads, this bracelet is very lightweight and flexible. It would make a wonderful Mother’s Day gift….birthday gift… or, don’t you need a new beautiful bracelet to go with your Easter outfit??? Call 785-694-2817 or stop by the craft peddler to sign up! Fee is $10.00 plus supplies. Hoping to see you there!!! 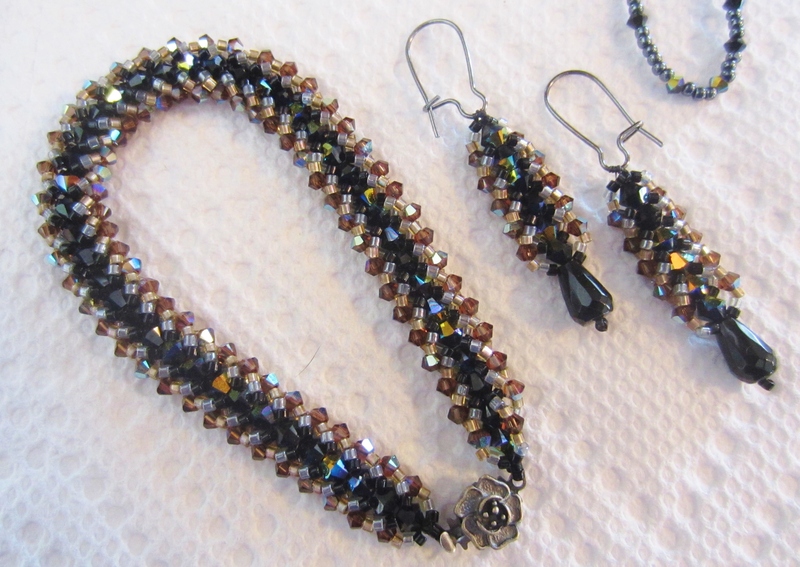 BASIC JEWELRY CLASS: Necklace, Bracelet, and/or Earrings – Sat., March 2, 9:30 A.M.
Val Chleborad will be here to show you the basics of jewelry-making. 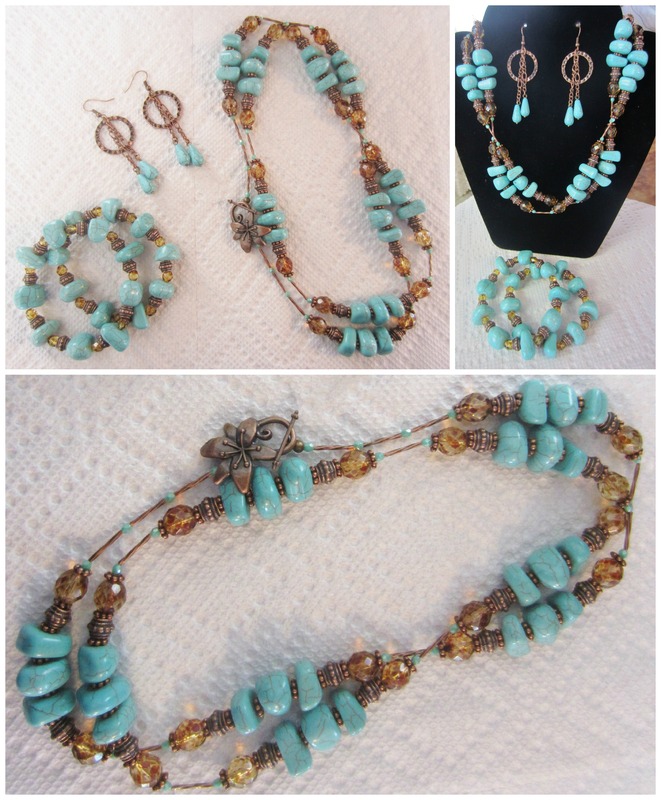 You can make a beautiful matching necklace, bracelet, and/or pair of earrings, using any of our beautiful beads and jewelry findings. The picture shows just a sample of something similar that you can make. Class starts at 9:30 A.M. and ends at 3:30 P.M. on Saturday, March 2. So call (785-694-2817) or stop by the shop to sign up….space is limited so sign up soon! Val is an excellent teacher, and we always have a great time in class! Of course, refreshments will be served, but you may want to bring your lunch…or the cafe will be open here in town, too. Cost will be $10.00 plus supplies. See you then!!! Bob Ross Class on Sat., March 23, 9:00 A.M. Here is the next Bob Ross Class we will be having at the craft peddler. 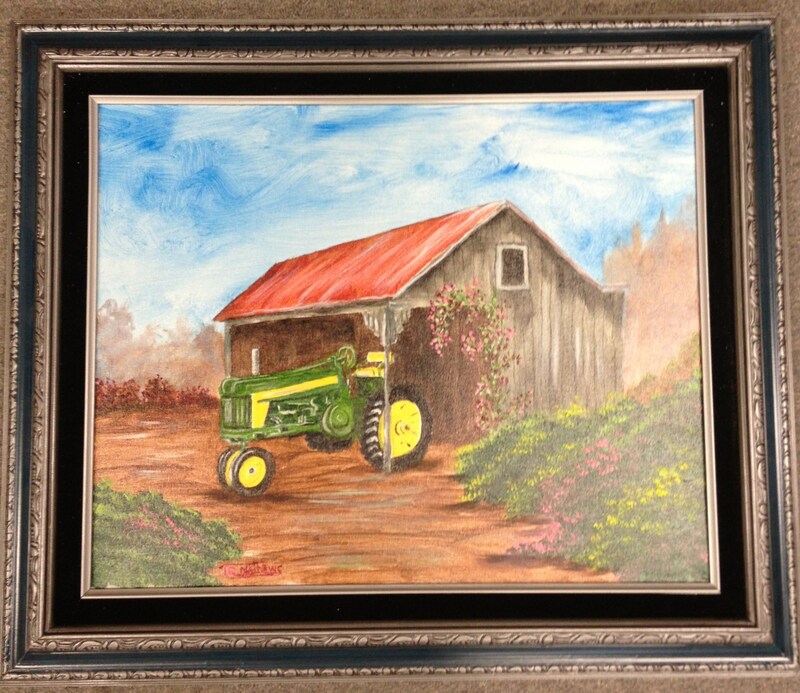 Ok, if you don’t like the “green” tractor, you can make it a different color! Once again, T.R. and Sandy will be here to teach the class at 9:00 A.M., Saturday, March 23. If you are interested in signing up, please give us a call (785-694-2817) or stop by to see us. Fee is $75.00 if they provide supplies, and $65.00 if you provide ALL supplies. Pre-registration fee of $35 is required. Let us know if you have any questions. Sign up soon, because we already have several signed up….and our classroom will only hold about 10!